Recent events in Sheikh Jarrah are part of a wider process — the Hebronization of East Jerusalem. The only way to stop this destructive process is to protest on the streets. This Saturday night (March 6 2010) will witness one of the most important demonstrations in years, in the struggle for human rights and justice here. A struggle against injustice and dispossession, against the Hebronization of East Jerusalem, and against the anti-democratic processes undermining Israeli society. In this struggle, Sheikh Jarrah has already become a symbol. But as in any struggle for justice and equality, that has never been the goal. The goal is justice and equality, human rights and a future that embraces all human beings without distinction. Saturday night’s rally organizers hope to attract thousands and to finally make justice ring in Sheikh Jarrah. If successful, it may gradually become possible — to move beyond symbolism to the true purpose of the already months’ long Sheikh Jarrah struggle: justice. Hagai El-Ad is the Director of the Association for Civil Rights in Israel (ACRI). He blogs at the Huffington Post, where he recently posted an incisive article on Sheikh Jarrah. The deliberations in the Knesset yesterday (February 3 2010) breathed new life into Joseph McCarthy’s legacy. After a week of incitement against the New Israel Fund (NIF) and its human rights grantees, the nonsense reached parliament. And as if carefully reading the instructions for would-be new McCarthys (“McCarthysm is the politically motivated practice of making accusations of disloyalty, subversion, or treason without proper regard for evidence”), here’s how Israel’s parliament deliberated with the upmost seriousness the “Data transfer for the Goldstone Report by the NIF and lefty organizations”. The discussion did not only demonstrate utter disregard to facts, it actually defied common sense. Here’s an eclectic tasting-menu from yet another day in the ongoing project of dismantling Israel’s democracy. This suggests the following philosophical question: what is a worse crime – feeding one’s enemies with false data, or with real one? Or, putting the sarcasm aside for a moment: how is MK Danon going to find out if the questions raised with regard to the IDF’s conduct during Cast Lead are true or false, if there won’t be any credible investigation into Cast Lead? MK Chaim Amsellem (Shas) seemed terrified, while continuing to demonize: “Jewish and Israeli people, with a clear agenda that is very specific, their voice sounds constantly, on all channels… they get a stage everywhere, are professors at universities, serve in public bodies; each report they publish and every fragment of a press release that they issue receives disproportional headlines and becomes the talk of the day – without almost having anything to really discuss.” Terrifying indeed! Perhaps these dangerous individuals should somehow be silenced? But it gets even more terrifying. Something truly sinister is lurking in the dark, but the courageous defenders of Israel will soon expose it. Read on. So: is it anti-Semitism or not? Erdan helps us solve the dilemma: “Those organizations, companies and friends, are part of the global campaign of radical, extremist Islam, in its fight against the free West…” One has to wonder – is Erdan the new local prophet of neoconservatism? MK Eldad seemed to be rejoicing in the sound of catching those lefty, Arab traitors. I was hearing noises too – but found no reason for joy. Catching traitors? I don’t think so. 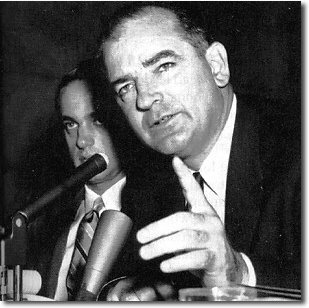 The sounds I was hearing were those of Senator Joseph McCarthy grinning at us from the past, rising from his grave. The noises of the undoing of a democracy. A Hebrew version of this article appeared on NRG, Maariv website, this afternoon (February 1 2010.) For background, see Noam Sheizaf’s wrap, Hadas Ziv’s critique and an exposé of the funding of the NGO behind the anti-NIF by Pastor Hagee and CUFI. The scandalous report by Ben Caspit in Friday’s Maariv (“Our contribution to the materials out of which the Goldstone Report was made,” January 29, 2010), set a new low in the wave of mudslinging against the human rights and civil society organization in Israel. Many of us saw Caspit’s article, read it and were shocked – by the inflammatory tone, the McCarthyistic style, the impudence and the salacious “charges” based on the “investigation” by the organization, Im Tirtzu. And if that were not enough, they added to that an ugly and shameless personal attack against Prof. Naomi Chazan, President of the New Israel Fund. This article is too brief to list Chazan’s record in defending human rights, promoting social justice, civic and gender equality, freedom of religion and democracy in Israel. With her leadership Chazan has contributed tremendously toward the creation of a better and more just Israeli society, of which we are all a part. No mudslinging, as ugly as it may be, can take the least bit away from her brave, determined and moral record. The cliché about patriotism being the last refuge of the scoundrel is unfortunately appropriate for the present assault against the New Israel Fund. Unfortunately, the present slander is not the first – and will probably not be the last. Campaigns of delegitimization against human rights organizations in Israel and against the Arab public have become a painful part of daily life in Israel. Instead of dealing honestly with the tough challenges facing Israeli society, there are many who choose to attack those who dare identify those challenges. If extreme organizations such as Im Tirtzu, NGO Monitor, Yisrael Beiteinu and their partners succeed, the ones who pay the price will not “only” be the civil society organizations in Israel or human rights activists. The price will be paid by our democracy and its citizens. The harm caused to the future of Israel and those who live in it will be intolerable. What is on the balance is not a matter of image nor is it a passing trend; gradually, the essence of democratic life in Israel is evaporated. The current assault focuses on the contribution of Israeli human rights organizations, who receive grants from NIF, to the Goldstone report. This is a particularly grim example of the way those who refuse to deal with an uncomfortable reality instead attack the human rights organizations. Had the government listened in the first place to the reasoned arguments of the human rights organizations in Israel right after Cast Lead, as to the need to conduct a credible investigation in Israel, the report by Judge Goldstone’s committee may not have ever come to be. 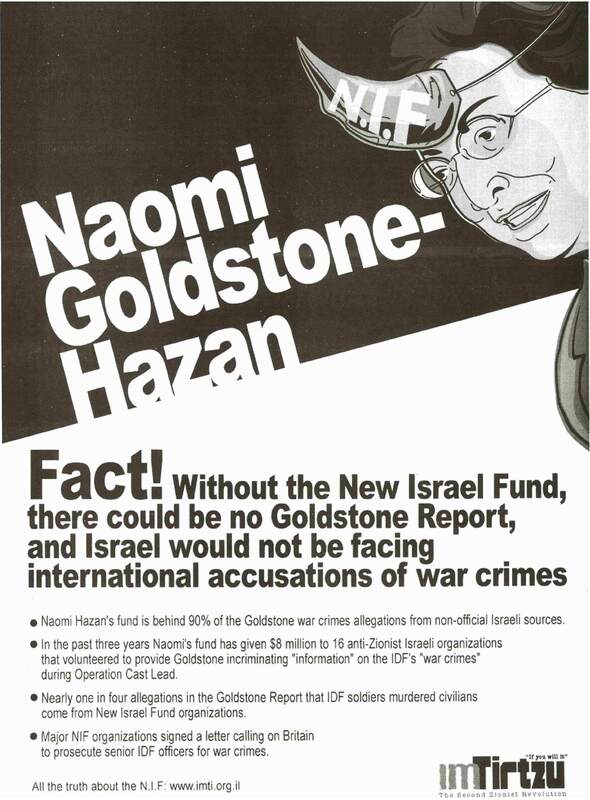 Im Tirtzu‘s campaign refers extensively to the damage caused by the Goldstone Report to Israel’s public image. This is an embarrassing mistake in the reading of reality: The fundamental damage (including to Israel’s image) was entirely the result of the policy decisions made willingly by the government of Israel, from its management of the war to its refusal to investigate its own actions. Presently, after months of confusion, it appears that the state may decide to conduct an investigation after all. Even the outgoing Attorney General, Menachem Mazuz, openly and unequivocally now supports an investigation. Does Im Tirtzu plan to slander and vilify him as well?